1) Sitting in the back of my camp bus with a bunch of kids singing "The Love You Save" over and over to the AM radio. 2) Watching the Jackson Five cartoon series on Saturday mornings. 3) Finding it hard to believe he'd have such a huge hit with a song about a mouse from a horror movie ("Ben"). 4) Watching NBC-TV's "Motown 25 Special" where he moonwalked his way across the stage and blew the world's minds. 5) Always inserting "I Want You Back" on every one of my early 80's party tapes. Motown made a resurgence in when New Wave was in full force. 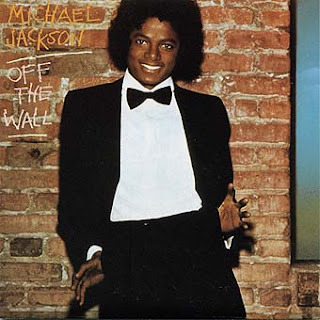 6) Although Thriller sold a bazillion copies, I always thought the one before it, Off The Wall, was better. Less theatrical, more gritty. Who could top the bass intro and whirling arrangement of the opening "Wanna Be Starting Something?" That came very close to my favorite, "Rock With You," written by Rod Temperton. Just that little snare drum snap to attention intro, and you had to go dancing with Michael. Great vocal overdubs, chord combos, hiking up a half key, and you didn't have to moonwalk. Rolled up my blazer sleeves and got taken in. Uploaded by Discodandan. - Watch more music videos, in HD! Well and truly played, Drew. It wasn't hip for a long-haired rocker to like MJ's music, but it never failed to compell me to dance and sing along. When the Queen of Cool, K.T. Tunstall, covered "I Want you Back," it was both a validation of a great tune, and a worthy tribute to an icon of my childhood. And, who hasn't, at least once, busted a Thriller move? Rest in peace, Dancing Machine.